Spontaneity is the spice of life, so we recently invited our A-List Wine Club members out for an impromptu vineyard walk with a just a few days’ notice—and were delighted when nearly 50 members took us up on it! On a bright, warm morning, winery co-proprietor Karl Wittstrom led the group on an informative two-mile walk that circled Block 49 at our estate Margarita Vineyard. 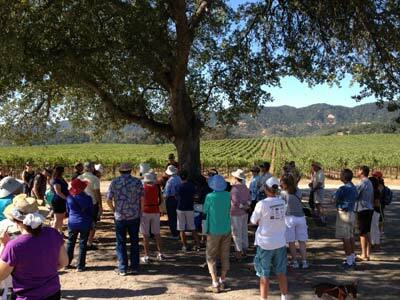 Along the way, guests got to sample Cabernet Sauvignon, Zinfandel and Syrah grapes on the precipice of harvest. 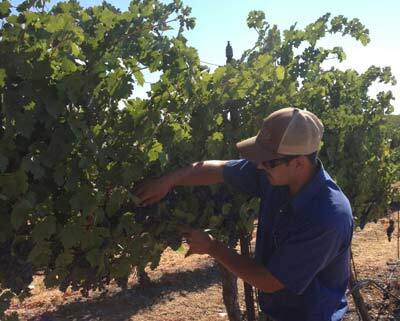 Halfway through the walk, Vineyard Manager Jaime Muniz (pictured below) joined the group to share insights into vine canopy management and other viticultural techniques. The walk concluded with morning snacks (including grapes, of course!) in the shade of a large legacy oak. This is the latest example of how we like to go the extra mile—or two, in this instance—for our wine club members. For those of you who are thinking of joining, check out this chat with our own Nina Leschinsky, who shares the many unique benefits of being an A-List Wine Club member.